It’s 6:30 am, and I’m at home on my back deck trying hard to not let Mother Nature distract me from my writing. A cup of coffee is at my side. The song of morning birds provides a backdrop for the tap, tap, tapping of my fingers as they strike the keyboard. I am reflecting on my latest weekend adventure. Last Sunday, I met up with my former college roommate for a grand Kennebunkport adventure. I’ve been there, but each time previously, it’s been to work on an event. This time I had a “heart hankering” to play tourist. When I arrived at my friend’s home in Brunswick, she presented a cooler packed with snack sized raw veggies, crackers, Garlic and Herb Bevre Balfour Farm, Organic Dairy, and Homestead Creamery cow’s milk cheese (think Chevre without the goat) and an especially grand bottle of Notorious Pink Grenache to be enjoyed on our lobster boat cruise. A grand start to a grand adventure! 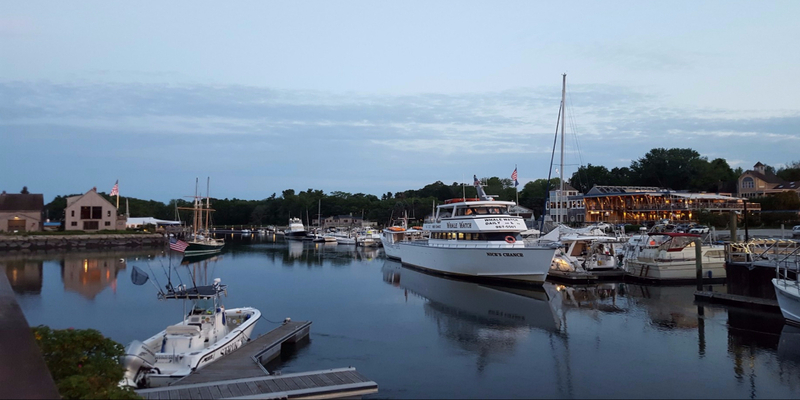 Upon our arrival in Kennebunkport, we hunted down a parking space, and then set off to explore. After visiting a few gift shops and galleries, we decided to check out Mabel’s Lobster Claw for lunch. 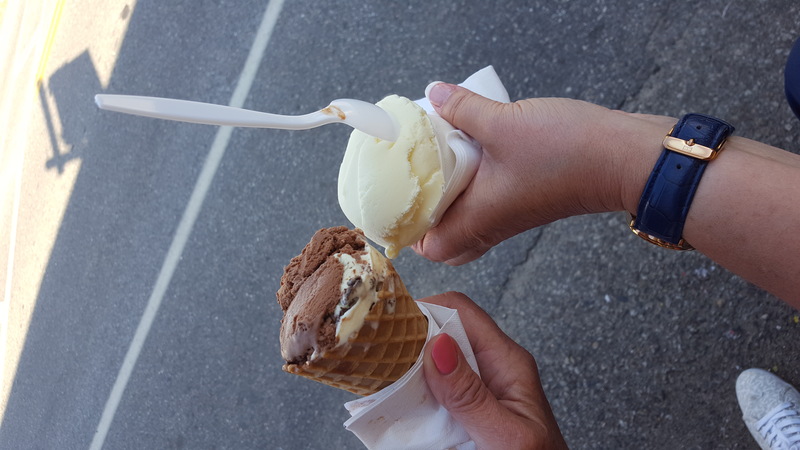 Mabel’s is famous for the Bush family eating lobster there and serving George Bush’s favorite, peppermint ice cream. It’s just down the street from Walker’s Point. I ordered lobster meat on a bed of lettuce. Donna ordered a crab meat sandwich. Her sandwich was more like a crab cake in a hamburger bun. My lobster tasted like it had been previously frozen. We passed on dessert as we were short on time, but when eyeing the options other diners were enjoying, that was not an easy decision. Soon it was time for our destination date with Rugosa Lobster Tours. Once we were headed out on the boat, Donna pulled out our snacks and poured each of us some wine as our hosts Dave Colman and Phil Browne entertained. 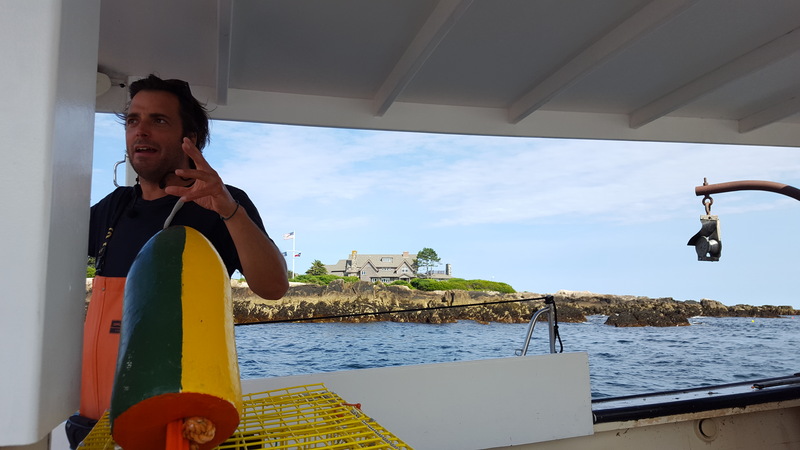 Mixed with a good sense of humor, they pulled up lobster traps as they explained lobster anatomy, along with information about sustainability, buoys, and other various tidbits. Each person got a good look as Dave passed the lobsters around. A good time was had by all aboard. Lobsters were once known as “poor man’s chicken” and were regular fare in Maine prisons. Live lobsters can be green, blue, or yellow. They turn red when cooked. Lobsters shed their shells, making them vulnerable to other sea life until they grow back. A female lobster can only mate once she has molted. Maine lobster traps are baited with salted Herring. Females have bigger tails than males. Males have larger claws than females. 28 grams of protein in one cup of lobster meat. Researchers report “settlers” – juvenile lobsters settled in hiding on the bottom of the ocean until they’re big enough to defend themselves – seem to be in decline, particularly in the warming waters of the Gulf of Maine. President Bush defended the lobstermen when the Secret Service wanted to shut down the waters to lobstering near Walker’s Point, the Bush family residence, for security reasons. A compromise was worked out. Lobster licenses can be passed down through generations. Once out of the family, these licenses are up for grabs. In 2016 the lobster industry hit a record high of $533 million, in part due to overseas (China) demand. Lobstering is a cash business, making a company’s profits hard to track. After our cruise, we were off to indulge in ice cream at Rococo. All flavors are made in house. We chose Maine Whoopie Pie; Dark Chocolate; and Salted Sweet Cream. 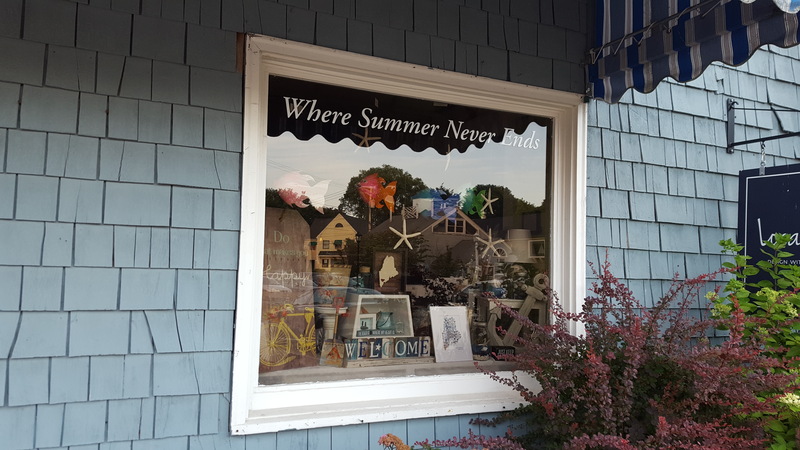 Next came light Christmas shopping in July at a friend’s gift shop, Beach Grass, a sweet place to find an ocean souvenir. This was followed by coffee because of course, we needed refreshment after all of that ice cream! 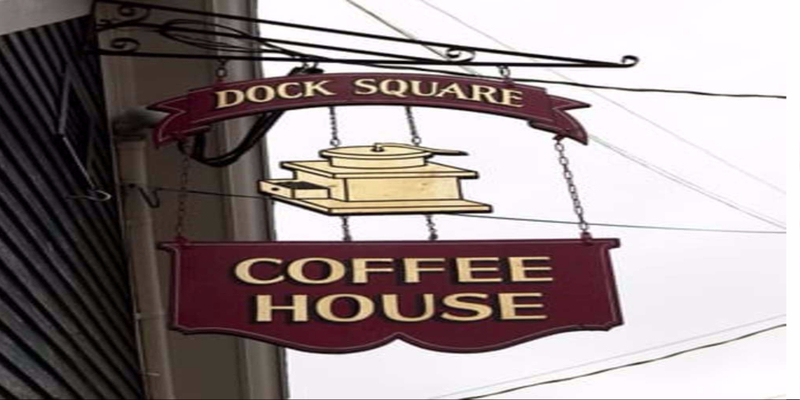 We found perfect hot and cold coffee lattes at Dock Square Coffee House. The day eventually came to a close with a late evening dinner at David’s KPT. We were fortunate to get a dockside table. 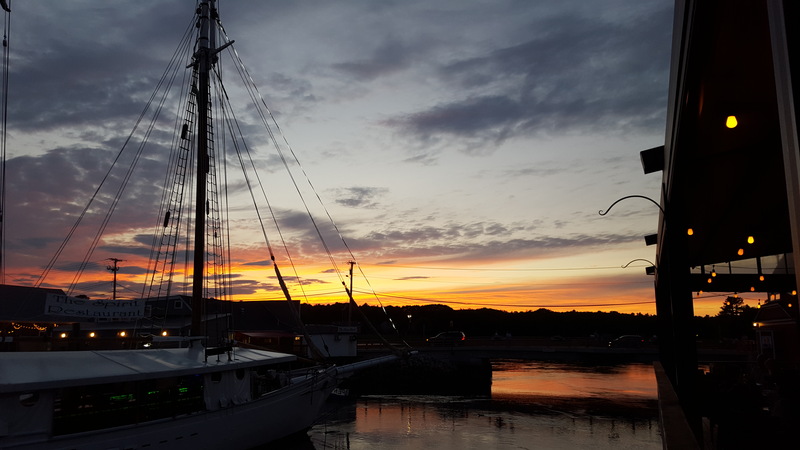 We enjoyed watching the setting sun and the lights come on in the harbor as we dined on skewered shrimp and scallops. I thought it was odd they came only with mashed potato and no other vegetable, but the seafood was worth the price of admission. After a sweet finish of Maple Crème Brulee, we called it a day. I’m on the lookout for my next Maine food inspired adventure. I wonder where it will take me. Suggestions are welcomed.